David E. Snediker is Of Counsel in Cummings & Lockwood's Corporate & Finance Group and is based in the Stamford office. Dave joined Cummings & Lockwood at the end of 2013 following his retirement from the international law firm of Paul Hastings where he served as a real estate partner for more than 30 years and was a founding partner of that firm's New York City and Stamford, Connecticut offices. Dave has represented banks, investment banks, pension funds, private equity firms, investment advisors, high net worth individuals and family-owned real estate businesses on local, national and international real estate-related transactions, including acquisitions and dispositions; development and leasing; fund formation; partnerships and joint ventures; traditional and securitized mortgage and mezzanine lending; foreclosures, workouts and restructurings; asset management; brokerage activities; and governance matters. 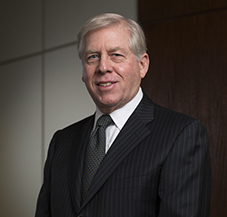 He continues to advise on similar matters as member of Cummings & Lockwood's Commercial Real Estate and Corporate & Finance Groups, while also serving as an independent director of Fieldpoint Private Bank & Trust, where he is Chairman of the Board's Nominating and Governance Committee and a member of the Board's Audit and Compliance, Loan and Compensation Committees.